Warm temperatures are a welcome prospect for women with Raynaud's (ray-NODES) phenomenon, a disorder that causes small blood vessels in the extremities to constrict during shifts from warmer to cooler temperatures. It affects mostly the hands, often the feet, and more rarely, the nose, lips, and ears, causing them to suddenly lose color and become cold and numb. More common in women than in men, Raynaud's is an exaggerated vascular response to the cold and, in some people, to emotional stress. Raynaud's with no known cause, called primary Raynaud's phenomenon, occurs mainly in women under age 30 and is generally more bothersome than disabling. It can usually be managed by avoiding unprotected exposure to the cold and taking measures to keep warm, such as wearing warm socks or gloves around the house or to bed. Raynaud's can be more dangerous when it's related to some underlying condition. This rarer form of the disorder, called secondary Raynaud's phenomenon, occurs later in life and often in people (men as well as women) with connective tissue diseases, such as scleroderma, systemic lupus erythematosus, or other autoimmune disorders. These conditions can damage blood vessels and change their response to cold or stress, sometimes resulting in problems with dexterity or ulcerated skin. Secondary Raynaud's is also associated with carpal tunnel syndrome, certain types of work (such as the use of vibrating tools), medications that constrict blood vessels, and damage to blood vessels from smoking, chemicals, and chemotherapy agents. When the body is exposed to cold, it acts to keep vital organs warm. Small vessels in the skin (thermoregulatory vessels) constrict, redirecting blood from arteries near the surface to those deeper in the body, to protect against heat loss. People with Raynaud's can have a similar response with even small changes in temperature. Their thermoregulatory vessels contract suddenly and remain constricted, reducing the flow of blood to the skin, which turns pale and cold (see illustration). Blood pools in the constricted vessels and becomes oxygen-depleted, which can add a bluish color to the skin. Eventually, as blood vessels relax and blood returns, the skin warms up, becomes flushed, and may throb or tingle. The blood vessels of people with primary Raynaud's may also react this way to hormones that are naturally released in response to emotional stress. Raynaud's has been recognized and researched since the late 19th century, but its underlying mechanisms are still poorly understood, and we don't know why it disproportionately affects women. Blood flow in the skin is regulated by complex interactions involving nerve signals, circulating hormones, and various substances released by cells and blood vessels. Some people with Raynaud's may have too many receptors in their thermoregulatory vessels for a neurochemical called norepinephrine, which causes blood vessels to narrow in response to stress or temperature change. The blood vessels themselves may produce vasoconstricting substances. About 30% of first-degree relatives (parents, children, sisters, and brothers) of people with primary Raynaud's also have the condition. Studies of extended families in which many members suffer from the disorder have identified several genes that may be involved. The fact that primary Raynaud's develops more often in women, usually between menarche and menopause, suggests that estrogen may play a role. 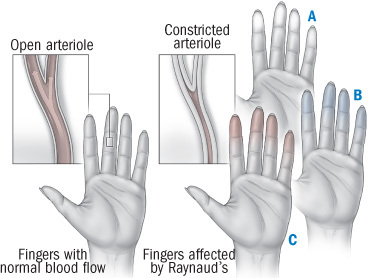 In Raynaud's phenomenon, fingers turn white (A) as small arteries in the fingers (arterioles) tighten, restricting the flow of blood to the skin. As oxygen in the blood is depleted, the fingers turn blue () and become painful. Eventually, the arterioles relax, and blood once again enters the fingers, warming the skin and turning it red (C). Changes typically begin in a single finger and spread symmetrically in both hands. Many people complain of having cold hands and feet, but unless tissues typically turn white or blue in response to temperature dips, it's not Raynaud's. A test that distinguishes primary from secondary Raynaud's is nailfold capillary microscopy. The clinician puts a drop of oil on the skin at the base of the fingernail (the nailfold) and examines it under a magnifying lens for enlarged or malformed capillaries — a sign suggesting connective tissue disease, and thus, secondary Raynaud's. If secondary Raynaud's is suspected, additional testing may be performed, including blood tests for abnormal antibodies (antinuclear antibody test), inflammation, and thyroid function. Protect against the cold. If it's very cold outside, try to stay indoors. When you do go out, keep warm — not just your hands and feet, but your whole body and head. (A general body chill can trigger an attack, even if the hands are kept warm.) Wear layers, thermal underwear, a scarf, a hat that comes down over the forehead (wind on the forehead can trigger Raynaud's), warm socks, and mittens or mittens over gloves (gloves alone allow more heat to escape). Keep wrists covered. Warm up the car before driving in cold weather. Indoors, wear whatever you need to stay warm day and night. Take a sweater or jacket (and maybe even socks and mittens) with you when you go to a movie theater or other indoor setting that may be air-conditioned. Protect your hands when removing or handling items from refrigerators and freezers at home or in groceries. Avoid cigarette smoke. Nicotine and other chemicals in cigarettes can cause acute blood vessel constriction as well as chronic blood vessel damage. Be careful about certain drugs. Some drugs can cause peripheral blood vessels to narrow, including decongestants containing phenylephrine or pseudoephedrine, diet pills, migraine medications containing ergotamine, herbal preparations containing ephedra, and the blood pressure medication clonidine (Catapres). Check with your clinician about the use of these drugs. Caffeine triggers Raynaud's in some people; try avoiding it for a while to see if that helps. Act quickly to end an attack. Once a Raynaud's episode starts, get warm as quickly as possible. Soak your hands or feet in warm (not hot) water. Put your hands in your armpits. Rotate your arms in a whirling or windmill pattern; this can help send blood to the fingers. Manage stress. In some people with primary Raynaud's, emotional upset can trigger an attack or lower the threshold for cold-induced attacks. Relaxation techniques such as deep breathing and meditation may help decrease the number and severity of attacks. If emotional distress persists, seek help from a mental health professional. Exercise. Regular exercise is often recommended for people with primary Raynaud's, because it can improve circulation, relieve stress, and promote overall well-being. But you'll want to avoid activities that put you at risk for numb fingers and toes or injury to the hands and feet. Medications. The most commonly used drugs are calcium-channel blockers, which are vasodilators, that is, they relax the blood vessels and allow more blood through. They can also help heal the skin ulcers accompanying secondary Raynaud's. But they also reduce blood pressure, with side effects such as swollen feet, headache, and lightheadedness. For people who don't respond to calcium-channel blockers or can't tolerate their side effects, other vasodilators are available, including niacin and nitroglycerin. Nitroglycerin can also be applied topically, to help prevent blood vessel constriction in the hands or feet and to heal skin ulcers. Other drugs that may help are ACE inhibitors and angiotensin-receptor blockers, which dilate blood vessels, and alpha blockers, which counteract the vasoconstricting effects of norepinephrine. In secondary Raynaud's, drugs may be needed to treat the underlying medical condition. Biofeedback. Research suggests that people with Raynaud's can sometimes control their skin temperature and blood flow in peripheral vessels by using behavioral techniques such as biofeedback or autogenic training. In biofeedback, your fingertips are hooked up to sensors that "feed back" information on your conscious efforts to alter the temperature in your fingers. Autogenic training teaches you how to relax through the use of self-statements about warmth, such as "I am getting warmer." Other treatments. In severe, worsening Raynaud's, clinicians may use a procedure called sympathectomy, in which nerves that trigger blood vessel constriction in the affected area are blocked or destroyed by surgery or a chemical injection. Sympathectomy is used only as a last resort, because it doesn't always provide lasting relief, and it's associated with serious complications. Keep in mind that most Raynaud's can be managed with conservative measures and medications. If you think you may have Raynaud's, see your primary care clinician first. She or he can refer you to other specialists as needed. Recovering from a serious fall can take a while. Rearranging the house is an easy way to prevent falls. Top causes of falls at home include floor clutter, slippery bathrooms, throw rugs, and electrical cords. Fixing these issues can go a long way to avoiding falls.